Creative Scotland has identified the Environment as one of four the connecting themes that underpins its work and the work it supports as the national development agency for the arts, screen and creative industries. How can we and those individuals and organisations working within the arts, screen and creative industries help contribute to Creative Scotland’s Environment Connecting Theme? 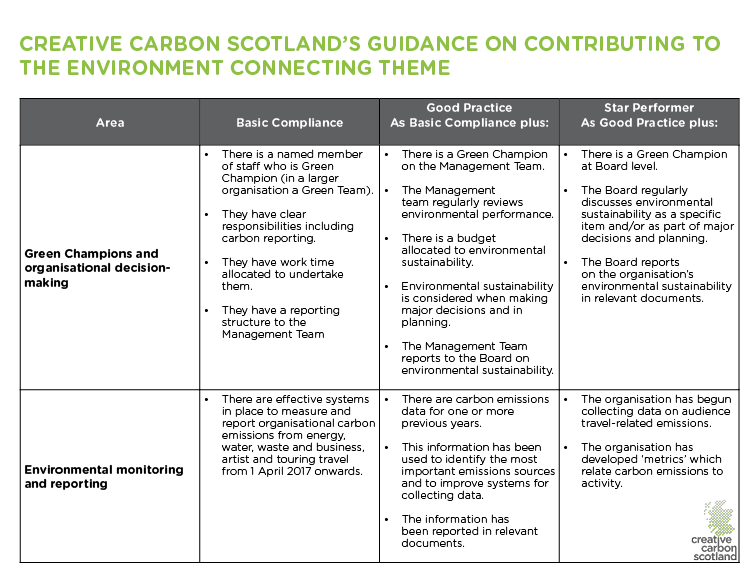 We have provided the following guidance to highlight ways in which you and/or your organisation can lead by example and create a more sustainable Scotland while contributing to the Environment Connecting Theme. 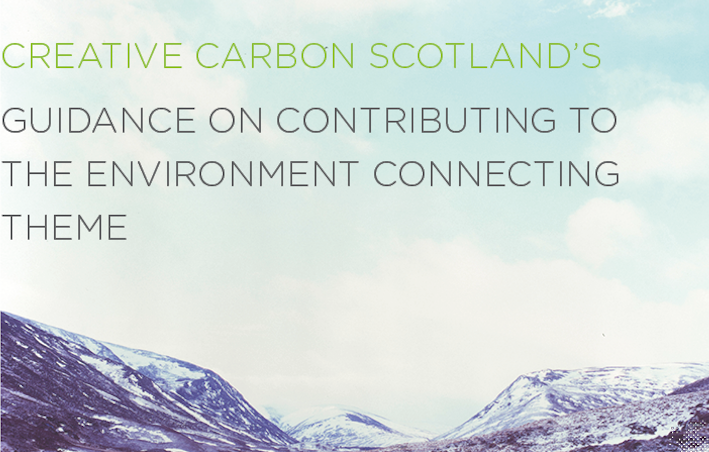 Since 2011, we (Creative Carbon Scotland) have been supporting those working within the arts, screen and creative industries to reduce their organisation’s carbon emissions and environmental impacts as well as influence others about climate change and environmental sustainability. We have produced this guide to share what we think the basic, good and star contributions to the Environment Connecting Theme would be. or read on for the web version. 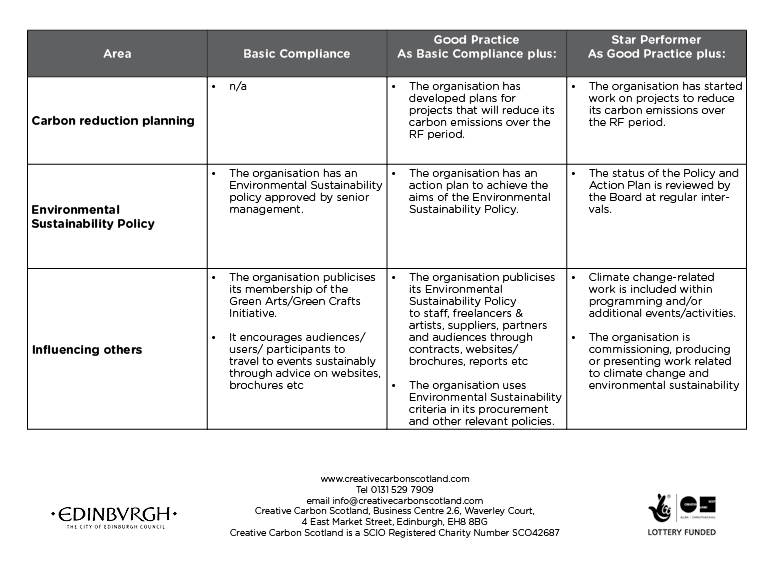 The following table shows what we think would be Basic Compliance (ie the bare minimum for an application to hold its head up); Good Practice (ie an organisation that has good standards in this area); and Star Performer (ie an organisation that is leading the way) . We go into more detail below. Below we’ve indicated some places to start with helpful guides and examples to support and inspire you! Appoint a Green Champion, or in a larger organisation, a Green Team. Develop an environmental sustainability policy and action plan. Join the Green Arts Initiative. Plan how to report this work to your Board. Include information about the work you are doing to reduce your footprint on your website, brochures, programmes, annual reports etc including membership of GAI!! Encourage sustainable travel by audiences, artists, freelancers and visitors. If needed, develop your travel policy and plan. Want to learn more about the Environment Connecting Theme? We are hosting a series of workshops in February 2017 to further explore this subject and answer any of your questions. In the meantime, feel free to get in touch with Fiona MacLennan (fiona.maclennan@creativecarbonscotland.com) or Ben Twist (ben.twist@creativecarbonscotland.com) for more support.